Environmentalists — Bad For the Planet? For those not quite sure what to make of the melee that calls itself the environmental debate–and maybe even for those who reckon they have it sussed–there was a very interesting edition of Analysis on Radio 4 this week. Here’s the blurb. The BBC’s Ethical Man Justin Rowlatt asks if environmentalists are bad for the planet. Are they being distracted from the urgent task of tackling climate change by a more radical agenda for changing society? I’m not yet sure what to make of the debate, not having paid sufficient attention and not having a scientific background. I do believe that the stifling of discussion is not generally A Good Thing, though, so I’m concerned to hear people who are clearly better informed than me, and appear to lack an ulterior motive, expressing doubt about the way in which reality is being represented. 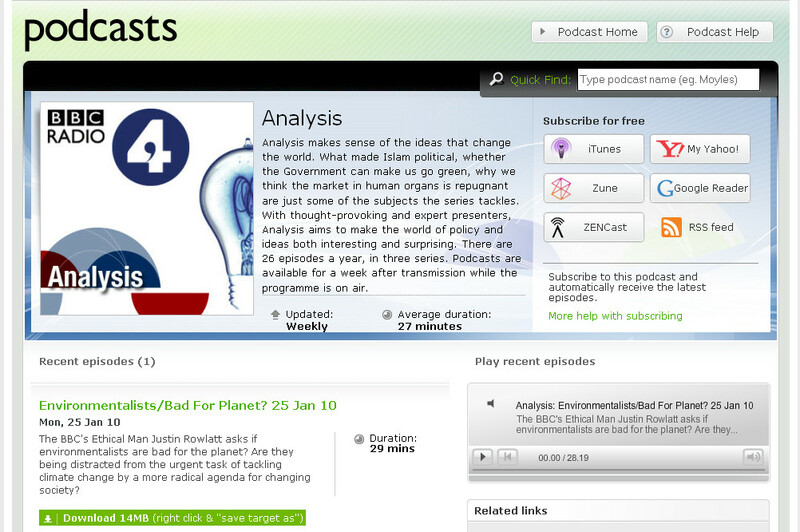 Anyway, dash across and listen to Analysis (or download the podcast) here, if interested. Radio 4 podcasts are only available for a week, so best make haste if you’d like to hear it. This entry was posted on Thursday, January 28th, 2010 at 8:03 pm and is filed under Climate Change, Debate, Scepticism. You can follow any responses to this entry through the RSS 2.0 feed. You can leave a response, or trackback from your own site. 28 Responses to Environmentalists — Bad For the Planet? It’s the media who want a polarised “yes” or “no” not the scientists. As with all science its a hypothesis not a fact. On a much smaller scale I think I told you that I was invited to send a piece in to TGO on whether air travel was acceptable, yes or no, and they sent it back saying it wasn’t decisive enough. It seems “Yes” and “no” sell in the media, but the real world is far more complicated and vague. Better to position yourself to get by whatever the outcome rather than put all your money on one horse. IMO just because the hypothesis is in debate doesn’t mean we shouldn’t take avoiding action. Even if the probability of severe climate change was only small the outcome is enormous. Risk = probability x magnitude of the outcome. I’ll have a listen. As far as wind turbines are concerned, I recommend you read John Etherington’s book “The Wind Farm Scam”. I’d say more but we’ve been working all hours to get Lynne’s new book ready for the publisher and I’m oh so sleeeepy. Mungo needs his bed too. Many thanks: I’ll look that book out. More interestingly, though, what is Lynne’s new book? That sounds *very* exciting! Until the publishers finally agree a title I can’t say anything more than it’s out in early July, assuming there are no glitches. It’s not a climbing or walking book though. John Etherington’s book may well depress and infuriate you in equal measure. Here’s another one which I haven’t read: ‘The Real Global Disaster:Is the Obsession with ‘Climate Change’ turning out to be the most costly scientific blunder in history?’ By Christopher Booker. It seems everybody’s got their own agenda, in this case he’s against renewables because he wants to push for nuclear. The figures for energy generation and distribution are so complicated it seems anybody can make them say anything. One things for sure, if our addressing climate change turns out to be a costly blunder, our not addressing it might turn out to be a costly catastrophe. Here’s an earlier comment I made which didn’t appear (something to do with my browsaer I think). It’s the media who want a polarised “yes” or “no” not the scientists. As with all science its a hypothesis not a fact. It seems “Yes” and “no” sell in the media, but the real world is far more complicated and vague. Better to position yourself to get by whatever the outcome rather than put all your money on one horse. So IMO just because the hypothesis is in debate doesn’t mean we shouldn’t take avoiding action. Even if the probability of severe climate change was only small the outcome is enormous. Risk = probability x magnitude of the outcome. Thanks for this Shirl – it’s good to see an open enquiring mind on this subject. “Whether or not you believe that the earth might have been getting warmer lately, if you are sceptical about whether mankind is the cause of it, the scepticism can be enough to get you called a denialist. It’s a nasty word to be called, denialist, because it calls up the spectacle of a fanatic denying the Holocaust. I think Justin Rowlatt has it spot on when he suggests that the climate change debate is grabbed at as manna from heaven by the Greens as a new way of changing society, as anyone who disagrees with their hypothesis is instantly labelled a ‘denialist’ and so their opinion should not count. It is murky territory that the media and politicians are now treading. People who do not take as read that man made climate change is a fact are now unsurprisingly more distrustful than ever about the motives of those supporting the claims. I couldn’t agree more. Even suggesting that people read a couple of books which put a contrary view leaves one open to attacks of the most unsavoury kind. I think this is a real problem i.e. the way in which people are sometimes demonised for expressing non-mainstream views in relation to controversial subjects. It happens often these days, of course, but over the years it’s particularly worried me in relation to an entirely different subject, i.e. that of Muslim women wearing veils and the burka. My own view is that women, given genuinely free choice, would be unlikely to opt for covering up all or part of their bodies lest they stir up aggressive sexual responses in blokes, but it’s become difficult even for women to express that POV without being labelled racist (or even–bizarrely–sexist, on occasion). I’ve concluded that the best way is simply to say what one thinks, if the subject-matter feels important enough to encourage us to enter the fray. Expressing a non-mainstream view is often an uncomfortable experience, though, which (IMO) is a very damaging and philistine position for us to find ourselves in, in what’s meant to be an evolved and free-thinking society. afootinthehills, I hope my comment following your two suggestions wasn’t seen as an unsavoury attack? I’m all for anybody reading what they like. If my comments about “Without The Hot Air” seem sceptical, well they are. Ditto “The Wind Farm Scam”, “The Real Global Disaster:….” and “The British Wind Energy Association”. With so many vested interests at work, all skewing the data and interpretations to their own ends, it may actually be impossible to form any conclusion that can truly be trusted. In any case, isn’t the whole thing just a convenient smokescreen to divert us from the real problem:- too many people. Nobody wants to talk about that, but it has been said – without a lot of exaggeration – that if that was solved, the rest would disappear. Exactly Geoff. Even without that I would say it would be impossible to form a conclusion, but it seems that “I don’t know” isn’t a voice that will be listened to. Not at all. I was making a general point about the type of attacks that are directed at anyone who even suggests there might be an alternative point of view on climate change, not at your comments. The problem as I see it is that there is too little scepticism around on this subject. In any event, I didn’t join the outdoor blogging community to engage in such correspondence, civilised though it is on this blog, and in retrospect shouldn’t have responded to peewiglet. I’m sorry to hear that. For me the great thing about a blog like this is that whilst it’s a pleasant read most of the time, it’s the non-outdoor subjects which get really interseting replies. This thread for instance. On a wind turbine forum (which I don’t visit) everybody would be pro wind turbines, and on an anti-windfarm forum (which I don’t visit) everybody would against windfarms, neither of which give a balanced debate. Well now’s your chance to have your say, but I would say that if the media seems to have accepted the anthropomorphic climate change theory, it’s because the majority of the scientific community accept the ACC theory. Outdoor types do like their new gear and do like travelling to the start of their walks. One air journey to the start of the PCT, for instance, would be enough carbon for a lifetime of baked bean tins. Its the wrong problem – as has been said by another commenter – too many people, plus we’re losing biodiversity too quickly, which can’t be good. Drowning a few fenlanders (sorry, Alan) would surely resolve the problem by reducing population and consumption and the sea would return to its late ice age levels and we’d all shiver to bits. A projected reduction in the population of Europe (of some 17 millions) is seen as an economic disaster when, in fact, it would also be a very significant reduction in the redistribution of carbon. Man made global warming is something man can do something about. Not man made global warming would be out of control and much too scary. You replied as I was writing, Mike! I agree on the ‘too many people’ issue. I can’t begin to think how to solve that, though. I certainly don’t like the communist China approach of crushing families who have more than one child. I’m so glad to see that others are interested in/concerned about this topic, and unsure about what it’s possible to believe. afoootinthehills — I’m very excited by the mention of Lynne’s new book, and very much look forward to buying a copy when it comes out. I’ll watch your blog with interest and keen anticipation. Risk = probability x magnitude of the outcome. Absolutely spot on, IMO! In my former lawyerly life it was always acknowledged (when peeps were arguing in court about potential negligence) that a small risk of a catastrophic outcome materialising must weigh as heavily/possibly more heavily than a big risk of something relatively trivial happening. In relation to this discussion, knowing how to assess the likelihoods appears to me to be v. difficult, and the costs involved in attempting to guard against a risk the magnitude of which we can’t currently assess are enormous. That means I’m not sure how the balancing excercise should be performed. I certainly don’t feel that I know enough to have formed a firm view one way or the other. I agree with you (also) that journalists are muddying the waters by ‘demanding’ certainty when no certainty actually exists, and attempting to present the case as though there’s a right/wrong answer based on the state of current knowledge. Ye Olde Slowman — I thought this post might interest you, if you spotted it *g* Seriously, though, that quote you’ve provided from what CJ said is one that struck a chord with me too. Hasn’t it been concluded, somewhere, that all cyber-disussions become meaningless when peeps start to accuse each other–either overtly or covertly–of being Nazis? The reason I found this week’s Analysis particularly interesting was the suggestion that some peeps very vocally interested in the climate debate are actually more interested in the idea of changing humanity than solving global warming (assuming for a moment that it needs to be solved). GeoffC — With so many vested interests at work, all skewing the data and interpretations to their own ends, it may actually be impossible to form any conclusion that can truly be trusted. I have to say that I agree again. Once again, though, I have no idea what an appropriate solution might be. I’ve just written a long post about why I wouldn’t be joining discussions like this again but it vanished for some reason, so I won’t bother re-doing it. Enjoy the continuing discussions. “The aim of debate should not be victory, but progress”, so I hope you make some! Thanks for posting this. I’ve just listened to it while walking the dog. A really good listen. Like Justin I feel a bit queesy about the way the Green movement has hidden agendas. I thought the UN guy’s comments about Greens turning into a bad religion rang true. I have nothing against either the Greens or religion as long as they seek to persuade rather than coerce. The Greens could be an obstacle to reducing our impact on the planet rather than a help. Whether there is global warming or not, it seems sensible to me to try to minimize our environmental impact if we can. Over the next few years I’m going to have a good look at how I might do that. Perhaps I’ll blog about it. Mike makes a good point about the hypocrisy of some (many?) Greens. I suspect that many, while well meaning, don’t have much of a different environmental footprint to Mr. (or Ms.!) Average. I’m glad you enjoyed it, and I, too, found the hidden agendas discussion quite disconcerting. I’ve not thought hard enough about how I might attempt to limit my own environmental footprint. I’ll keep an eye on your blog to see what you come up with. Risk = probability x outcome. Warming of the climate system is unequivocal. Anthropogenic warming and sea level rise would continue for centuries due to the timescales associated with climate processes and feedbacks, even if greenhouse gas concentrations were to be stabilized, although the likely amount of temperature and sea level rise varies greatly depending on the fossil intensity of human activity during the next century. The probability that this is caused by natural climatic processes alone is less than 5%. Sea levels will probably rise by 18 to 59 cm (7.08 to 23.22 in). There is a confidence level >90% that there will be more frequent warm spells, heat waves and heavy rainfall. There is a confidence level >66% that there will be an increase in droughts, tropical cyclones and extreme high tides. Howdy, John, and many thanks for the links. I’ll go and take a look. 26.7% of GDP on the banking crisis? That’s horrendous, if it’s accurately reported. The number of people x ave CO2 output per person is to great. We either reduce the number of people or reduce ave CO2 output. If we reduce population, who do we get rid of? 4% of the world population (the USA) produce 25% of the worlds CO2. Goodbye USA? Hardly. The greatest population growth is in developing countries. Education and prosperity seem to create low population growth, but in the oil age they also create CO2. How about we move towards a low CO2 economy? Fossil fuels are finite anyway. wattsupwiththat.com. It gets updated every day. Ta, Geoff. I’ll take a look.